This bread is so good, it is worthy of not just one photo, but two! I could possibly make this bread every day and never tire of it, it’s just THAT good! This was my first time making this recipe. I wanted something tasty to go with our turkey dinner. I’ve made many breads over the years, yeast ones being my most favorite. I love all the steps that come with making a yeast bread, the rising, the punching. There is so much that can go wrong, for one; the water temperature to dissolve the yeast in. I currently do not own a thermometer, yeah…I know, kind of odd since I am a baker. It is in my basket waiting to hit “buy” on Amazon! I have to admit I tend to just wing it and maybe that is really why I sometimes have the most amazing breads and of course the really ugly breads. I know many weight the ingredients, not here. I measure and move along. The texture of this bread is so moist and has a very light crust, as you can see in the picture. It cut with ease. Butter is it’s best friend too! Did I mention it is super simple too, so making this bread is not an all day event, although I enjoy making breads like that as well! The next time I make this bread I will make several loaves as with just two of us, it went quickly! In a large bowl, combine the warm water, sugar, and yeast. Let sit 10 minutes to proof. Stir in salt, rosemary, seasonings, olive oil, and all purpose flour. Add the bread flour and stir until the dough forms a ball. Knead on a lightly floured surface for around 5 minutes, adding more flour as necessary to prevent sticking, until smooth. Place the dough in a lightly greased bowl; cover, and let rise till double in size, about 1 hour. Punch down the dough and form it into a round loaf. Place it on a cornmeal dusted pizza peel or parchment paper; cover; and let rise until doubled in size, around 45 minutes. Meanwhile, preheat oven to 400 degrees. Once the dough has risen, gently brush the to with the egg wash and sprinkle with dried rosemary. Bake on preheated stone for 20-25 minutes, until top is golden brown & sounds hollow when tapped. This dough was incredibly sticky, could have been the climate here with high humidity so I had to use more flour than I intended but the bread still came out perfect. Just don't be alarmed if it sticks to your hands a lot, add more flour. Jeannie recently posted..Happy New Year! 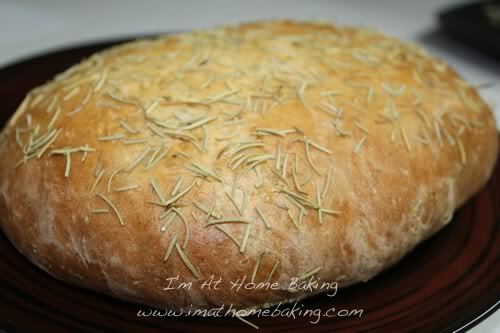 two of my favorite aromas are bread as it bakes and rosemary. this bread must smell (and taste!) amazing! I bet that smells awesome as it bakes. I love bread.